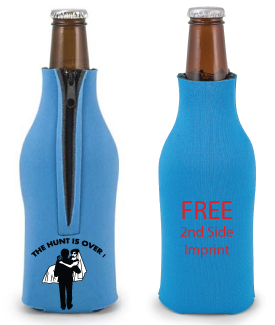 How to design your koozies? You have probably been planning your day for a long time. There are literally, a thousand details to take care of. One of them is the wedding favors. What do you give to your guests to express your gratitude? What gift would make this day as memorable for them as it is for you? One of the items which have become all the rage as wedding favor is the koozies. The limitless potential of design and the undeniable utility of this little thing have made it a popular choice as far as wedding favors are concerned. Check out the various sites over the internet which offer to design and supply koozies. Most websites have pictures of sample koozies pasted on the website. Browse these pictures to see whether you like the design or not. Even if you find something you like early on, it make good sense to look around a little. You may find something even more attractive. Make the basic choices first. Do you want a collapsible koozy or not? Collapsible koozies are very handy and therefore much popular. The non collapsible types are more difficult to handle, but they are cheaper. Sometimes, the koozy may come in a funky design and that is why it is not collapsible. Unless you choose such a design, it is better to choose the collapsible type. They will find greater favor with your guests. The next thing to decide is the material. They come at various price ranges and provide different levels of insulation. You can go for foam or neoprene depending on your budget. Once these decisions are taken, and then come the hard part. How to design your koozies in a way that will eternally mark out your day? Many online sites allow you to customize your koozies. You should always order from such a site. Some sites offer you step by step art guidance where a number of designs are given. You just have to click on the boxes applicable and gradually the design of your day koozy is formed in front of your eyes. Some websites allow you to upload your own art. If you want a particular script to be used, then it is better to opt for one such site. The design you put on the koozy depends upon you. You can simply write you name as Mr. and Mrs. In curlicue script; you can add a short message of love or you can print your favorite saying and date of wedding on the koozy. Some websites allow you to upload photos which can then be printed on to the koozy of your choice. Once the designing is complete, the online store will send you an estimate. If it agrees with your budget, you should place the order with plenty of time to spare. This is necessary to avoid any last moment confusion. Always insist upon seeing a sample. It may not look as good as you thought it would; the company may have misprinted something or the shade of color that you chose may not be available. So, it is better to verify the sample and then place your bulk order. If you give personalized koozies as wedding favors, every guest is going to remember your special day with as much fondness as you because, koozies are absolute necessity and are bound to be brought out and used during summers for years to come.